A German artist has immortalised himself at a place in France which stood for the enmity between the two countries. 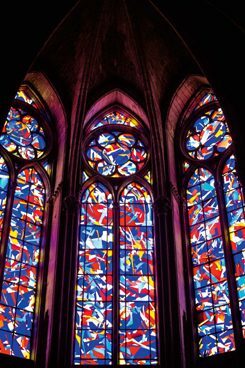 Imi Knoebel’s stained glass images in the Cathedral of Reims; | © Jonas Ratermann Most visitors walk past him. The “smiling angel of Reims” is so inconspicuous and so well hidden between the other stone sculptures of the cathedral portal that it can be easily overlooked. Its symbolic power, on the other hand, is immense. Because its smile survived the rubble of the First World War, it is regarded as both the face of catastrophe and of hope. The angel is nearly as old as the church itself. Sculptors formed its slender figure and serene visage in the thirteenth century. In 2014 another sculptor again plied his art in the cathedral – and in the name of German-French friendship: Imi Knoebel. France already commissioned the former Joseph Beuys student to make six new church windows on the occasion of the 800th anniversary of the cathedral’s existence in 2011. In the commemorative year of 2014, 100 years after the start of World War I, three further windows have been added, funded this time by the German side. For a long time it would have been inconceivable that a German artist should set his hand to this place. The memory of that September day in 1914 when German soldiers put the coronation church, a French national shrine, under constant bombardment and largely destroyed it was too painful. At the time, “Reims” became the emblem of the deep hatred that existed between the French and the Germans. Only after the First World War did the slow but steady change begin. From symbol of discord, Reims developed into a scene of cautious rapprochement. In July 1962 France’s President Charles de Gaulle and the German Federal Chancellor Konrad Adenauer celebrated a conciliatory service in the cathedral. A few months later their governments signed the Élysée Treaty in Paris. Today the two countries are among each’s most important partners in Europe. What does a German artist do in a space that is bound up with so much suffering for the regained friend? Tread on tiptoes, many would say, step back, restrain himself. But Imi Knoebel is not one for having his images speak in whispers. And so visitors to the cathedral have responded to them with surprise and confoundment when they walk from the entrance, watched over by the gently smiling angel, to the other end of the capacious church, where Knoebel’s stained glass windows behind the altar have a prominent place. The metres-high stained glass works are modern, colourfully loud, almost garish. They clearly differ from the other windows in the cathedral, which mainly depict biblical stories. Marc Chagall’s work from 1974 also relates stories from the Old and New Testament. In Knoebel’s windows, on the other hand, there are no figures and no episodes. Those so minded, however, can readily discern in them a reflection of the recent history of the place: explosions, burstings, glowing shards. Surfaces are composed out of unequal parts in various shades of red, yellow and blue: a huge, powerful puzzle of glass, about which the viewer has the feeling that it could shatter at any monument. Imi Knoebel, born in 1940 in Dessau as Klaus Wolf Knoebel, remains true to himself in this work. Again and again, the works of the minimalist have plumbed the relationship of colour, form and space. His abstract, large-scale images can also be seen in the German Bundestag. Not everyone was happy with the choice of artist for Reims. The first choice for the commission had been Gerhard Richter. Richter, one of the most influential German painters of his generation, had already designed a window area for the Cologne Cathedral. But the preferred candidate refused the offer and so made way for a work that has aroused controversy. Some find it inappropriate; others find it moving. One would like to know what the smiling angel thinks about it. Helen Sibum is an editor based in Frankfurt am Main.